Book Review: You’re A Worthwhile Person in More Ways Than A Million! Read a Description of You’re A Worthwhile Person in More Ways Than A Million! 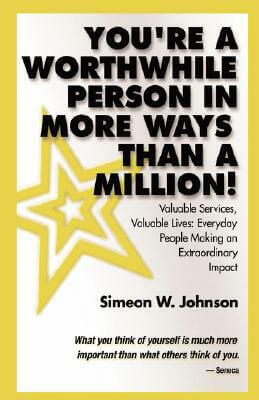 you're a Worthwhile Person in More Ways Than a Million by Simeon Johnson is an enjoyable, frank and honest read that lauds the everyday person and the jobs they do. Too often society overlooks the hotel maid, bus driver or the building superintendent. But Johnson points out that without these essential people who keep society functioning, our lives would come to a grinding halt. By telling the story of ’the average Joe’ the reader is forced to acknowledge the importance of their jobs. The reader is implored to ask themselves about their treatment of these people, the bellhop; the waiter or the coat check person. Are we snide, entitled and obnoxious? Or are we grateful and appreciative of the jobs they do for us? And while you're at it, ask yourself, how do you show appreciation for such people? Do you tip them properly or even better thank them for their service? This book gives us all something to think about regarding the position we play in society. It also serves as a recognition of sorts for all men and women who go about their daily lives and go to their jobs that often provide little or no recognition, appreciation and often times fairly low compensation. you're a Worthwhile Person is the equivalent of ’This Bud's For You’ the beer commercial, instead Johnson intimates ’This Book is For You.’ Hail to the cooks, cab drivers, subway operators, electricians and plumbers and countless other thankless jobs ordinary people do to provide the grease that keeps the wheels of society going. In one chapter, for instance, Johnson lauds a New York City Transit bus driver, Gloria Valez. Johnson describes how Valez cares for the safety of each passenger. She is patient with the elderly, tolerant of the young and the restless and polite to lonely people who talk to her despite a posted sign that advises against it. Valez is not just working for a paycheck or any sort of recognition, and outside of this book she will probably receive none, even from her employer. But, while standing at the bus stop on a miserably cold day you sure are glad to have her pull up and open the door of the warm bus and drive you to your destination. Other examples, when the air conditioning unit in your home goes out on a 90 plus day, you sure are glad to see the repair person come in to solve the problem and get you cool once again. And while you're in the hospital suffering from an illness or recovering from major surgery, you're surely to glad to see the nursing assistant who sticks around to comfort you after the much lauded nurses and doctors have gone home. Yes, there are many ordinary people who do their jobs diligently while they are overlooked by the people they serve. Read this important work and when you're done you are sure to have a new found respect for the everyday people who do so many important jobs’including yourself. Read To Be Determined’s description of You’re A Worthwhile Person in More Ways Than A Million!.